Many thanks to today's dedicated Wreckporters: Allie, Colin M., Ryan B., & Barb B.! As someone who graduated from Christoper Newport University in Newport News, Virginia, that first wreck had me rolling. I can totally see that happening! LOL at the last one! Good Luck Seth, You're in the Amy now! It seems to me that "Happy Baby x2" makes MORE sense than the other possible permutations -- "Happy Baby Baby" or "Happy Baby Happy Baby." At least the cake's message as it stands sounds kind of hip, to match its modern decor. I agree with Carol; the Happy Baby cake is too cute! Jen bleschu for this blog! Yes, second cake's a shame, as it's so cute otherwise. And the writing! Adorable. ohmygawd. what a friggin' hoot that last one is! i guess someone didn't ask or tell. Excellent cakes! Love your site. Just found it. I want to 'follow' (not like a stalker), but you don't have a followers button? I find the first one hard to believe. I found the last one completely believable . . . you know that saying, SNAFU? Originated in the "Amy" . . . "Situation Normal. Amy Fouled Up" (but expletive used in place of "fouled"). This may be the "best Seth can be" in the new "Amy." My sister and boyfriend's sister both attended CNU so I will be sending them today's wrecks especially! I would certainly find it amusing if Seth met and married a girl named Amy. I nearly spit out my chocolate milk at the first cake, rofl! I could hear the Southern accent as I read the cake! 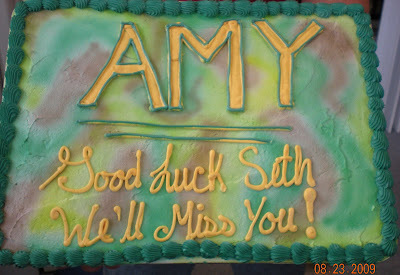 And LOL at the Amy/Seth one, especiallys since I have a cousin named Seth and his mom's name is Amy. My question is: Does Amy know? The "Army" cake must have been ordered from a Boston bakery...they tend to forget the letter R.
love them! my favorite is x2. As a mom of twins I LOVE the baby cake and would not have been offended by it at all. It's a heck of a lot cuter than the other 2 at least! The "Lavender" and Amy cakes are great! I have to admit - when I look at the "Amy" cake now - I can finally laugh at it!!!! I was furious when I picked this up at the bakery. And no, they did NOT charge me for the cake. Anything that could go wrong that day did, and this was just the "icing on the cake"!!! The Happy Baby x2 is a beatiful cake! What a shame they messed up the inscription. Even the handwriting is gorgeous! Un-freakin'-believable. I am floor that this site has SO MUCH fodder... Is there no end to the wreckiness. The CNU one is particularly hilarious. I actually really like the second cake. What was it supposed to say, if that's a mistake? Also, the writing is so freaking adorable, who cares? WriteCards - Thanks for the SNAFU explanation. I had no idea. Gotta love Cake Wrecks. Hilarious AND educational! "You're in the Amy now!" Allie must be invisible, or else very small. What was the "Happy Baby X2" cake supposed to say? "Happy Baby Happy Baby"? "Happy Baby Baby"? And anyway, how does "Happy Baby" make sense? Was there not enough room to write "Happy Birthday Baby" or "Congratulations on your new twins," or whatever the message was? Barb - at least you got the least poo-tastic camo frosting I've seen on Cake Wrecks. They actually did a pretty nice job on that. I really want to know what "Happy Baby X2" was supposed to say (or mean). 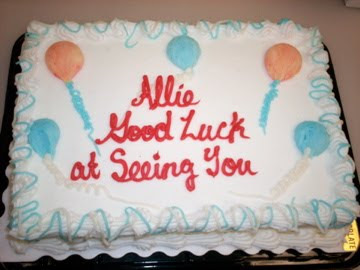 Maybe the baker was just being snide because he/she made a cute cake but was given an inscription that made no sense. Jen, Congratulations not only did the NY Times write a lovely article about your book, that article was one of NYTimes' five most emailed articles this week! "Lavender's" cake has some nifty bonus flecks of what I hope is chocolate cake on top of the pink icing. Is that supposed to be a preview of the inside, which in this case was probably supposed to be a yellow cake? The Amy is a very high maintenance fiancee, indeed! I was stumped by the "Happy Baby" one too. Could it be that they wanted *drawings* of two happy babies on the cake? That baby one would have actually been cute if they hadn't jacked up the lettering! It's just a wild guess here, that possibly the Baby x2 cake might have been for Happy Baby Number 2 (#2) and someone wrote an x instead of the # on the order sheet. Or I like the twins explanation too. Keep the wrecks coming Jen, we love you guys! What a shame about the inscription errors! Otherwise, today's entries aren't actually that bad...the colors are nice, the writing is very nice, the cakes are pretty...Oh well. Like most people, I am not sure what the heck the baby cake was supposed to have been. But at least it's gorgeously done, and probably has a funny story to go along with it. Yes, Lavender is a name. A very old-fashioned one. I personally, would never give an old-fashioned name to a child. So of course, I named my daughter..uh...Sara. Oops. Sorry Lavender and Rose and um...well, whomever. The first three are comfortably laughable. If I were starting at CNU, I would find it funny. Or at least not as offensive as being in Amy. Usage: This cake has a wreck, but it's gudnuff to eat anyway. I call "not a wreck" on Happy Baby X2. Both the cake and the writing are beautiful, and the quirky type matches the inscription. I agree, it's probably either for twins or a misunderstood #2. Either way, I think this baker did a good job! i love the last one! good luck seth your in the amy! lol! tee hee! My best friend went to CNU-- and every time she says "I love CNU" I am compelled to say "Awww. I love seein' you, too!!" Which makes the first wreck hilarious to me. Although maybe I should be embarrassed by this. On "Baby x2," definitely the nicest handwriting we've ever seen on a wreck! Makes you realize what lousy handwriting all those other wreckerators have. Sheesh! In defense of "Happy Baby x2", the cake itself is way way cute. Yeah, the Happy Baby Cake is great. I like the 60's retro design. But the CNU one is awesome - I used to live near there and I can say that sometimes the abbreviation in casual conversation could cause some confusion! Love it! so funny! the happy baby cake would be excellent if the words were correct! So, I watched "twins" today (so what), you know with Danny Devito and Arnold. In it there is this scene where Arnold rips his shirts with his muscles (everything is a double edged sword says Louis CK) and he gets his first t shirt. I'm not a hundred percent but I'm fairly confident the design on his shirt is your rebel carrot jockey, 86 the carrot. I don't get the babyX2 one. What was that supposed to be? I actually have a very good friend named Lavender! So for the first time, I can defend a cake, though the pink is a little out of control!!! Oh God...I went to CNU, and the favorite thing for the orientation-leaders to say before we left for the summer (and then came back for freshman year) was: "well be c-n-u!" Barf. But I love that wreck, haha! I also think the Baby x 2 cake is not a wreck and was meant for twins. I think it's cute! I recently discovered this hysterical blog after seeing the book in the bookstore where I work. I was looking through the book during my lunch and started laughing so hard I had trouble eating. I've been recommending it to co-workers and customers ever since. Does working with frosting cause brain damage? And if so, are some frosting flavors and colors more dangerous than others? I think scientists need to do a study on this. Really, what was the mistake on the second cake? The design was cute, the lettering well-done--and it was even a circle, not a squished blob. I think it was supposed to say "Happy Baby Times Two" or something like that for twins- but the person giving the order used shorthand or "X" for times. Allie's got to be good-looking, 'cause she's so hard to see. 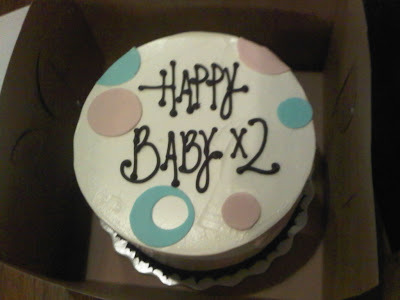 I really like the writing job on the "Baby x2" cake. I wish I could write that well on cakes! WV: hions - Most of those bakers were hions the crack while decorating those cakes! 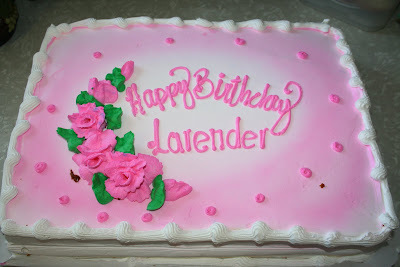 "Happy Birthday Lavender" had me literally laughing out loud! You know, I don't think even using the phonetic alphabet would have helped with the first one: "Good luck at Charlie November Uniform". At least that is so nonsensical that even the densest baker might think twice about whether they had gotten it right (and then proceeded to write it that way anyway). Is it just me or does the v and r in Lavender look the same? can the babyceke be ment to be an order of 2 cakes with habby baby on them? As a mom of twins, I think the Happy Baby x2 is adorable and appropriate! Hello all, I have to defend the "Happy Baby x2" cake. No mistakes were made on that cake. I'm the "orderer" of the cake and a total CW fan. There is only six inches of surface for writing and you have to keep it short and sweet. Shorthand was definitely in order and the mother loved it. She thought it was hilarious. And yes, the mother was carrying twins. A boy and a girl. Hence, the blue and pink circles. Hahaha! Lavender *is* a name (it's my name), and I love that the cake decorator didn't even question that possibility, and went with it. Of course, every time I actually give my name, it's questioned. So for all the other Lavenders in the world, this cake's for you!! !